The holidays can be an insanely hectic time. Now that they’ve finally passed us by, try to regain your sanity (and maybe even find a bit of inner peace) by listening to a dharma talk podcast. A dharma talk showcases a Buddhist teacher speaking on topics such as “Simple Knowing,” “Gratitude,” or “Helpful States.” You’ll find lots of tranquil choices at AudioDharma.org—some of which are under five minutes. There’s also a meditation timer on the site. If you find yourself feeling stressed or overwhelmed, consider calling a close friend or family member for a quick chat. Hearing the familiar voice of someone close to you is known to activate the areas of your brain that produce feelings of happiness and love. It will be a nice distraction from the rigors of your workday and will help reinforce the idea that everything will be better soon. Plan your meals for the week using the following guidelines, and put them together when you find the time. Limit cook prep. Purchase already grated cheese, jarred and sliced vegetables and fruit, etc., to keep preparation time to a minimum. Come up with a few “regular” days. Alliterative and punny days of the week like Meatless Monday, Taco Tuesday, or Stir-Fryday take a lot of stress out of choosing what to make that day. Pick a day and make the same, or a similar, meal every week until you feel like changing things up again. Leftovers are your friend. If you can’t finish it now, chances are your future self can help clear your plate. For instance, use leftover pork tenderloin to make zesty tacos the next day, or morph last night’s grilled chicken into a chicken-pesto-pasta dish later in the week. Sometimes the only relaxing notion in a busy life is imagining yourself as someone else. Take a few minutes and focus on what you would look like if you changed your appearance a bit. What would you look like if you wore glasses, or maybe a different pair? Try them on virtually at www.glasses.com/virtual-try-on. Ever wonder what you’d look like if you were bald or had bangs? The BaldBooth and YouCam apps have you covered. Who knows, you might stumble across a fresh look that you’ll actually want to try out! NJHS students at Linden Avenue Middle School in Red Hook, NY, hold a two-hour event each February to knock out some community service hours in their school cafeteria. In advance of the evening, the students send out requests to all teachers, religious organizations, and community action groups to learn of small projects they can help out with. Then, on service night, students gather and discuss the many projects available for consideration. Each project to be completed is displayed on a table, music is played, snacks are offered, and students select which station to work on based on their interests and skills. Projects typically include creating posters for upcoming community events, folding towels and blankets for the local SPCA, and counting change from donation boxes for local charities. NHS students at Burnsville High School in Minnesota decided to host a 5K run/walk to benefit a local organization called Pets Loyal 2 Vets, which trains and provides service dogs to veterans with post-traumatic stress disorder (PTSD) and other disabilities. The group rented a pavilion at a local park and used radio and newspaper ads, posters, and word-of-mouth to advertise the event. It was a great success, with 137 human participants and 57 dogs in attendance with their owners. The chapter raised $2,100! The student council at Ore City High School in Texas hosts a Tortilla Toss at each home basketball game. The participant who tosses their tortilla closest to a middle-court target wins a gift certificate to a business that has donated to the council. All proceeds of the event are divided equally between the school’s basketball team and the Texas Oncology Foundation. The Salem High School student council in New Hampshire decided to host an open forum where students could make their voices heard about the state of the school—what was going well and what could stand to be improved. A few representatives from each class led the forum, which was deemed a success. Student council members got some great feedback that inspired new ideas for school improvement efforts. Student council students at Legacy High School in North Las Vegas, NV, hold an annual event called “Kiss the Pig.” For three weeks, six teachers keep canisters in their classrooms to collect money for the council’s Global Children’s Fund. In addition, student council members also collect money during lunchtime. At the end of the three weeks, the two teachers who had collected the most money have to kiss a live pig at an assembly in front of the whole student body. Students went hog wild at that display! Be Bold, Be Bald is a national fundraising event where participants wear a bald cap (or shave their heads, if they’re feeling especially bold) to honor those who bravely fight cancer and those who raise money to help fight back against the disease. The student council at Shadow Ridge High School in Las Vegas set a goal of $1,000 for cancer research and met it! As a result, one popular teacher shaved both his infamous beard and full head of hair at a school assembly. You know what they say: hair today, gone tomorrow. Almost everyone at school, from students to staff, has a cellphone nowadays. Rather than allowing old phones to end up in landfills, NHS students at Hanover High School in Massachusetts decided to collect all the old phones they could and send them to an organization called TerraCycle that repurposes the phones and donates money to charity for each 10 phones collected. To date, TerraCycle has raised more than $15 million for charity! More than 6 million children are hospitalized each year. Although that can be a scary experience, NHS members at John P. Stevens High School in Edison, NJ, decided to assuage those fears by printing out templates and making activity books for school-aged children in hospitals. Participants made math puzzles, crosswords, word searches, and coloring pages for more than 200 patients and delivered the books to St. Peter’s University Hospital in New Brunswick, NJ. This activity allows students to discover the effects of poverty locally and the needs of those in their own community. Students will be reminded of those in need and participate in an activity to help them. Small toiletries, gloves, socks, gas cards, granola bars, etc. Ask students what they think about when they hear the word “poverty.” Record responses on the board. Explain that there are consistent poverty crises going on in your own community and in the United States each day. Show students websites that list poverty statistics, both in your community and in the nation. Discuss as a group. Then, have students go to the websites on their own. Students will make notes as they read through graphs and information. Students will create a “billboard” to show statistics they have learned and use it as a way to inform the public. They will make a plea to help those living in poverty by creating eye-catching phrases and illustrations. Students will present their “billboards” and discuss the thought processes behind them. Students will then make “homeless baggies” using the various items that have been collected. These will be donated to a local homeless shelter and/or handed out throughout the community. ProcessingWe hear about poverty around the world, but oftentimes students may forget those affected by poverty in areas closest to them. It is important for students to reflect on the needs of their community before trying to comprehend poverty on a global scale. Students really enjoy this project, especially when they get the opportunity to hand a bag to someone who is obviously in need. Students will write a journal entry about a need they see in their school that focuses on kindness. Discuss entries and make a list of things students suggest. Watch YouTube videos “Pay it Forward” and “How to Change the World With Kindness.” Discuss thoughts—Why is this important? What can this do for our school? What can this do for our world? Write a thank-you note to someone who deserves more appreciation. Smile at the first three people you see. Help another student with their homework. Reach out to someone new. Hold the door open for at least one person. Send a card around the bus for everyone to sign, then give it to your bus driver as a thank-you. Bring coffee or treats for your teacher. Write an anonymous note of appreciation to one of the school employees, teachers, or students. DeLana Parker is a sixth-grade language arts teacher and NJHS adviser at Charles T. Koontz Intermediate in Asheville, NC. Bullying. This hurt that students experience has been around in many forms since the dawn of public education. It used to be evident: Schoolyard fights with obvious origins. The age-old boy who feels less love from home tries to make himself feel good by degrading someone else in the form of a fight. Parents and teachers handled bullies in many ways including, but not limited to, simply telling a student to stop the behavior or suggesting the victim stand up to the bully. Bullying occurred right in front of educators. The behavior could be seen and, therefore, presumably handled. As the years went on, the concept evolved. Suddenly, bullying wasn’t so obvious anymore. Cyberbullying has become prominent as internet access has become more pervasive. Cyberbullying allows students to make statements they may think they’re not accountable for, because this world (on the internet) may be perceived as imaginary. The pressures of cyberbullying occurring in real time while students are learning can cause great distraction to educators. The anxiety of the online world begins to creep into the classroom, and suddenly the student audience that appeared engaged is clearly in another world, worried about who they are as people. I am the principal of Apalachee High School in Winder, GA. My staff and I work tirelessly to address cyberbullying and make a positive impact on the young men and women who attend our school. Here I share my insight on the issue of cyberbullying in hopes that some knowledge may be passed along as we fight this battle together as educators. Whether you realize it or not, as an adviser you play a primary role in discovering and understanding what students are experiencing outside the classroom. Because advisers are leaders and choose to work with students in extracurricular activities, they know what students are going through and can address this in a proactive manner with the students participating in their programs. “You truly get to know the students when you are spending more time outside the classroom with them. This develops healthy relationships,” says Amanda Pugh, SkillsUSA adviser at Apalachee High. SkillsUSA specifically focuses on workplace, personal, and technical skills. Because the primary goal of the program is to assist students with improving their personal skills in building self-confidence and supporting others, it is easy to address the negative impact of cyberbullying. Pugh focuses on teaching students the negative impact behavior on social media can have on postsecondary opportunities, such as college admissions and career readiness. She often takes time in her law class to show students case law on instances of cyberbullying as a way of addressing the situation proactively. “I think being open and honest with students about the consequences and repercussions of risky behavior online is helpful,” says Jordan Bohannon, English teacher and National Student Council adviser at Apalachee High. The most significant moments come when students realize how dire the outcome can be and how heavy the law is relating to consequences. “I believe they know when something is inappropriate to post, but they don’t understand why or to what extent,” she says. Bohannon says that she believes online behavior is tied to levels of self-esteem. As advisers, it is critical to the role to be bold about student behaviors online. Because the adolescent population generally exhibits empathy when they are taught about the negative outcomes of online behavior, take the time to illustrate what can occur when students are not cognizant of their words and actions online. To serve students fully and help them achieve academic success, school leaders should investigate when poor behaviors occur online. Because these behaviors impact the mental well-being of the student body, it is important to handle these reports with great care and dedication. It is much easier to hold the position “this conversation occurred off campus and not during the neat hours of 7:00 a.m. to 3:00 p.m., and so we are not inclined to become involved.” However, when incidents go ignored, students suffer. School administrators and counselors spend countless hours on cyberbullying cases attempting to determine where something may have started. The most important role we play is working with students in small groups when something negative occurs. Counseling students and building positive relationships are critical to the success of individual students and, often if the group of potential bullies can be identified, the root of the issue can be explored. In my experience, it is very often a misunderstanding. Once students see the negative impact their words have on others in a group setting, their empathy becomes apparent almost immediately and cases get resolved. Our role as leaders is to resolve concerns and issues so engaged learning can occur without the stress of comments that hurt the makeup of our students. If you’re looking for some inspiration on how to encourage messages of positivity throughout your school, seek wisdom from peers in the Adviser Online Community (https://community.nassp.org). Some schools choose to paint images of positivity in critical places, such as women’s restrooms. Given that cyberbullying occurs largely with females, this is a proactive way to deal with mental health and self-esteem. This approach to cyberbullying addresses the issues head on and ties into the idea that cruelty online is linked to self-esteem. In addition, Murphy Middle School implemented a bullying box to encourage students to report when they see inappropriate behaviors online. In this way, the school has been able to navigate more difficult situations before they spiraled out of control. Students have responded in such a positive manner when they receive the shirt. They are proud about why they received the shirt and are excited to share what they have contributed. At the time of this writing, our goal is for every student to have a shirt by the end of the first semester, December 2017. When we return from the holiday break, all students will report to the stadium and we will form the word “PEACE” and create a circle around our track. We want to illustrate to our community that we are family and we protect one another, promoting support and kindness to self. When this kindness to self is strong, we are able to be kind to those around us. This proactive approach to bullying appears to make an impact on behavior in the hallways, and it also illustrates how significant each student is to each teacher. The origin of all bullying remains the same: One person feels down about themselves and uses some platform to put others down. We used to be able to see it happen, but today it often happens with the identity of the bully being hidden. With vigilance, school administrators can track down the origin of cyberbullying attacks and illustrate to the student body how important it is to build strong relationships with one another and promote a school culture of trust and support. When teachers build relationships first and model the significance of slowing down to have a conversation with their students and with their colleagues, they are combatting negativity. This small act is not so small after all. We are charged to teach our students far more than the content they need to move into the postsecondary world. We are charged with modeling kindness, compassion, empathy, and support. If students do not feel happy every day at school, they cannot focus on developing academically or socially. Educators have the esteemed position of making a significant impact on bullying behaviors simply by being good role models. Language and culture are the key ingredients to battling the cyberbully. We have to teach students how to talk to one another and build a culture focused on contribution. Jennifer Martin is principal of Apalachee High School in Winder, GA.
An academic pep rally. Incentives replacing demerits. Passion that inspires all students to pursue their dreams. School spirit is surging at Rockdale Magnet School for Science and Technology in Conyers, GA. Much of the credit belongs to a student council leadership team nicknamed “The Magnificent Seven” for its power to reshape the school. Seven young women—seniors of the Class of 2018—have forged friendships across varied backgrounds. They’ve learned to work together and create a collective impact. Guided by student council adviser Susan Powell, all seven earned the recognition of National Student Council Distinguished Student Leader (DSL), undertaking the rigorous process that documented their individual leadership qualities and prompting reflection on the meaning and definition of leadership. “The Magnificent Seven” recently shared four years of leadership lessons learned—and many laughs—with Advise. In addition to Jordan, we spoke to First Vice President Bridgette Benefield, Second Vice President Sydney Turner, Parliamentarian Rachel Hill, Historian Madeline Burkey, Back-to-School Week Committee Chair Asiah McWhorter, and Faculty Appreciation Committee Member Jessica Kamuche. Advise: You are all in a rigorous academic program and busy with other activities. Why add leadership to your plates? Madeline: Student council offered the opportunity to spread our wings and put into place our ideas about how to make the school and the community a better place. Bridgette: It was a challenge. I saw what every other kid did; it was easier doing the wrong thing. I wanted to be that one person who did the right thing and helped people realize that you don’t have to do wrong to be cool or popular. Advise: Why choose student council as your leadership outlet? Jestini: Student council allows you to be creative, but it also allows you to use your voice and show that you know what you’re doing and let others mimic that. It allows you to bond with others while also building yourself and just doing what high school is about: becoming that adult and that leader. Madeline: We not only interact with the students and put emphasis on how important it is for them to develop who they are as a student and as a person outside of school, but we also try to focus on our staff and our teachers and show them how much we appreciate them and how much we love them. Advise: As student council leaders in a magnet school, does your role include coalescing all the students who come from different parts of your area? Asiah: One of the most valuable lessons I’ve learned from being part of a group of young ladies who all come from different backgrounds is that you don’t have to water yourself down, but sometimes you have to lessen yourself and step out of yourself to hear what other people have to say. It’s amazing to see how one perspective from each of us can come together and become something big. Rachel: Even though we have strengths and weaknesses, when we come together, we get the job done. That has shown our classmates that coming from different backgrounds, we’re all students who can work together. Advise: What have you learned from each other over the years? Asiah: From Maddie, I learned that sometimes you have to be quiet more than speak up. I learned from Sydney that sometimes you need to make sure that your voice is heard, even though that might cause discord. From Jestini, I learned that sometimes you have to step up when nobody else is willing. I learned from Bridgette that sometimes you have to speak out [about] what’s real and what needs to be said. I learned from Rachel that you get things done. And I learned from Jessica that everything’s always done with a smile, and it’s easier when you’re happy. Bridgette: I don’t think it’s really what we learned from each other. It’s how we grew together. None of us would be the person we are today if we hadn’t all joined through the council. Rachel: I learned dependability. I can’t do it all myself. I have to depend on each and every person to do their part and to be a part of the team as a whole. Then together we’ll achieve the common goal. Advise: Looking back as seniors, what would you do differently? Sydney: I would follow more. I chaired so much, and I didn’t know what I was doing. I made it seem like I did, and it was good to have that, but at the same time, I had to work harder in order to learn what to do when I could have just stepped back and watched. Rachel: I would have encouraged more people to join. The more people, the more hands you have, the greater the difference you can make. That is how you grow as a council. And maybe more male participation, because women outnumber the males on our council. Advise: How has being a leader impacted you or your future plans? Sydney: I can talk a lot, but talking and communicating are two different things. Yes, my mouth is moving, but what is coming out? Student council helped me learn how and when to say stuff and get it across appropriately. Bridgette: Coming into my freshman year, I decided I was going to go to this college in California. I was going to be a California girl. Becoming a leader made me realize it’s not about where you go. It’s about who you meet and how you build on those relationships. Madeline: I’ve been able to find my voice. I’ve become more outspoken, more confident in my ideas, and able to pursue the creative ideas that might be in my head. Advise: What’s the biggest fear that you have overcome? Bridgette: This is truly my favorite question, because my biggest fear was myself. I used to act out, every day, all day long. Student council taught me how to channel all my negative energy into positive. Helping other people feel good about something they’ve done makes you feel way better than insulting them. All that leads to what I want to do in my future, which is to open a mental health facility. I want to have a voice for people who might not know how to speak for themselves. Jessica: The biggest fear was failing, not like failing in a class, but failing yourself. At times, you feel like you could have done better, or something didn’t go as you expected, but we learned what we could do better and not to put ourselves down. Advise: Is your school a better place because of your leadership? Bridgette: All of us coming together is what changed our school. It didn’t even start with us. It started with our two past presidents, Sammie and Marissa (National Student Council Distinguished Student Leaders and current University of Georgia students Sammie Addisu, Class of 2015, and Marissa Hernandez Christie, Class of 2014). Everybody in our school can come to one of us with anything, and we will have a solution between the seven of us. Everybody can relate to student council, not just the leaders or the popular kids or the really smart ones. Madeline: We helped change the student body’s perspective on service. We implemented a commemorative walk called “11 for 11,” honoring first responders and veterans in our community. It shows how important it is to honor those in our nation and in our community who are giving back and have given everything, even given their lives. Sydney: All seven of us are very transparent by showing the school that we have passion. We have passion for student council. We have passion for ideas. That’s why I think more people are coming to our events or supporting our causes. Rachel: The legacy I want to leave is believing in yourself, because each and every one of us had to believe in ourselves. If we can teach everyone to believe in themselves, then they can take that into the future and incorporate it into their future goals. Advise: What have you learned from the Distinguished Student Leader process? Madeline: Before I started, I had no idea there were so many different categories of leadership. The whole process was learning how I function. How can I make my leadership style better so I can better serve the council? Bridgette: It was realizing that leadership isn’t just telling people what to do or where to go or how to get there. It’s following. It’s uplifting somebody’s day. It’s the little things. Asiah: I will never forget how important self-reflection is. You can’t grow if you don’t know where you stand. Advise: Now that you’ve been through the Distinguished Student Leader process, how will it help you in your future? Asiah: I learned how to eat an elephant. When my eighth-grade teacher first asked me how you eat an elephant, I said, “Um. You don’t.” But she meant that you have to stay persistent and take it one piece at a time. You don’t see the finish line. You just keep working and working and working until you get there. Jestini: I learned about stepping back and appreciating myself, and looking at what I did in a positive instead of a negative light. At the end of the [Distinguished Student Leader] portfolio, I thought, “Wow, I’m this type of leader. I’ve done this much.” A lot of times I look at a situation and think, “Darn, I should have done this better.” I can use that “take the positive, leave the negative” skill in the future. Jessica: Doing the portfolio has also shown us, and me personally, what I’m capable of. I’m not saying it was just me, of course, but there were certain things that helped the council in a better way, and I feel like doing this process shows I can do so much more in the future. Bridgette: This was my life lesson of why I shouldn’t procrastinate. I would have alarms on my phone every day, and I still was not getting anywhere. I had to sit down one weekend and just talk to myself. I’m really glad I did, because it made me realize who I am, how I lead, how many people I worked with, and how much we’ve accomplished. Advise: Why should others apply to be a Distinguished Student Leader? Asiah: It was like harvesting the fruits of my labor. Just being able to say, “Asiah, you’ve come so far, you helped so much, you’ve changed so much.” It wasn’t so much of, “Ooh, I might get a scholarship for this. I’m going to get an award.” Everybody who has led in student council or National Honor Society should be encouraged to do something like this. It’s truly beneficial. Bridgette: Everybody always says, “Oh, the student council experience has been great,” but what nobody says is, “Asiah, I love the way you did this, and I’m really glad that you planned that.” The DSL program really showed you that you did this, and it’s self-rewarding. The process made me realize I can do anything. You can do whatever you want to do. You can prove whatever you need to and get wherever you want to be. M. Diane McCormick is a writer based in Pennsylvania. To learn more about the Distinguished Student Leader program, visit www.NatStuCo.org/distinguished. Tensions were high one winter morning at Lancaster Central High School. There had been word a student was threatening to attack the school, and the rumor was swelling—through texts, social media, and nervous chatter. But a unique structure for governance in the school helped stop it cold. Lancaster High, located just east of Buffalo, NY, has a sophisticated system for bringing students, staff, and administrators together to give students a voice and solve problems—and this day it paid off. The group, called Students Working to Improve the School Setting (SWISS), brings together representatives from a cross-section of the student body, staff, and administration at Lancaster High. The organization takes shape through student government, but representatives are suggested from underrepresented segments of the school such as ESL, special education, and vocational training programs—along with representatives from each organization and interest group, and traditional student leadership organizations. SWISS exists alongside a student union that is also broadly representative, and student recommendations from both groups are taken seriously at the school and district levels. Skowron says he and the administration believe that such structures promote student engagement in their schools—a growing priority in school policy nationwide. Experts say involvement in school, community, and even national politics or international affairs teaches students important lessons and benefits the school and society. At Penn State University, Dana Mitra, an education professor and education policy researcher, has done research showing that it pays off when students are involved in education policy. She is author of the book Student Voice in School Reform. Mitra says administrators are increasingly finding—and research also shows—that student involvement improves school climate and academic quality and raises issues from a student’s perspective that adults might not see. “The concept of increasing student voice in schools broadens the notion of distributed leadership to include considering young people themselves as capable and valuable members of a school community who can help initiate and implement educational change,” she says. At Brooklawn Middle School in Parsippany, NJ, student council adviser Lou Miller and the school’s new principal wanted to get students meaningfully involved in school decisions, so they established regular meetings between administrators and student representatives. In Montgomery County, MD, all middle and high school students have an opportunity to vote and elect a student member to the school board. In Pearland, TX, this year a high school senior will be sitting on the district board (after having ousted a well-entrenched, two-term member to become the youngest elected official in the United States). Mike Floyd says his election to the Pearland Independent School District’s School Board happened because of a youth voter registration drive that netted hundreds of new voters and because of help from a national program that supports candidates younger than 35. One activity had members voting on a student-chosen rule change. After student leaders had an opportunity to campaign using a variety of commonly used tactics, the vote was repeated. Cline invited elected officials to further explain campaigning and elections. “By the end of the activity, we get rules changed at our school, and the kids learn a ton about how to run a campaign,” she says. Keep in mind that student voice does not have to be limited to the school setting. In Colorado, students have worked on behalf of ballot initiatives that affect their schools. For example, student leaders at Durango High School became interested in a property tax increase referendum because they felt some school resources needed further support from the funds. They formed a coalition with other student groups, brought in speakers to answer questions, further investigated how the money would be used, and then passed a resolution and got their opinion published in a local paper. The initiative passed, and the students believe that their voice played a role in its success. As they looked at the campaign for mayor locally, one student expressed his concern. “He noticed that one candidate never said what he was going to do, but spent all his commercial time suggesting there were scandals and lies involving the other candidate. The student asked me how we can vote for someone who only criticizes others and complains and doesn’t offer solutions,” Mullen notes. The most recent presidential election got student attention in many schools. Students were able to express their voice through mock elections at Loveland High School in Colorado, where the student leaders asked representatives from both presidential campaigns to visit the school and speak before the students voted. An area legislator also spoke about the importance of voting. At Westwood High School in Austin, TX, the student council promoted a mock election in social studies classes, with announcements and posters in the halls. It was part of a yearlong awareness program that included assemblies on the candidates, as well as discussions about key issues and structured social media conversations during the presidential debates. At Woodland Regional High School in Beacon Falls, CT, student council adviser Chris Tomlin saw a divisive U.S. presidential election coming and wanted to affect how it would play out in their school. “This last presidential election cycle, with its hyper-polarization and political discourse, pushed us further and demanded that we be more diligent than ever before,” says Tomlin, noting that while participating in the election was a priority, he and council members were concerned about how it could affect the climate at the school. In the spring of 2016, his council began working with administrators, the journalism department, and other school leaders to present good information about the presidential candidates in flyers, posters, and speeches. They also sponsored carefully monitored online forums—all in an atmosphere where civility was a priority. “We collectively decided that we wanted to educate the student body by being nonpartisan and encourage students to speak freely and openly about issues,” he says. Tomlin believes the students became well informed in a civil atmosphere, and excited—and that their excitement spread to the community, where results were publicized. “When we brought the results down to the main office, co-workers asked who had won. They reacted like the students had just elected the next president, even though the real election was the very next day. I just loved how adults were taking the students’ opinions as seriously as the opinions of the country at large,” Tomlin says. Jim Paterson is a writer based in Lewes, DE. Schools have an opportunity to use a proven structure for student involvement through Raising Student Voice & Participation (RSVP), a program developed by NASSP and NatStuCo. RSVP, which will be relaunched this coming spring with fresh content, offers detailed guidance that includes a series of student summits, structures for communications with administrators, and ideas for issues to tackle. The summits are run by trained student facilitators who get feedback from all students and then use that information to formulate a plan to present to administrators. He points out, however, that adult moderators are key, especially when discussing “trigger” issues. “Setting ground rules and sticking to them are essential,” Sherrill says. Keith Hawkins is a national youth speaker who addresses more than 400,000 students, educators, business owners, and parents each year. He has addressed the United Nations Global Summit, has been interviewed by TIME magazine, is featured in a book on public speaking called Between One and Many, and co-authored the books Teen Power and Beyond and Go M.A.D. He has dedicated his life and work to improving the human race by helping everyone strive for personal change in their lives. Hawkins was also one of the keynote speakers at LEAD DC and LEAD Chicago this winter. Advise: When did you know you wanted to become a motivational speaker for the secondary student audience? Hawkins: I’ve been around speakers ever since I started high school. After my junior year, I knew I wanted to inspire students the way speakers had inspired me. When I heard a speaker named Phil Boyte say my name in his speech, my road to becoming a speaker was created through my imagination. Advise: Your company, Real Inspiration Inc., has four key beliefs: relationships, empowerment, attitude, and leadership. Why are these tenants so important to today’s youth? Hawkins: I believe one of the most important aspects of our lives is relationships. Relationships are what help us get through our daily lives, not to mention things we might struggle with. Our relationships with our self, work, school, family, and friends help to shape who we are as individuals. Being in a position of influence means you can empower others. If we all felt more empowered, confident, and encouraged, our environment would dramatically improve. Feeling good about who you are in your life is so important. Feeling empowered is a direct effect of happiness. The saying goes, “When you look good, you feel good.” I think it should be the other way around: “When you feel good, you look good.” Being empowered draws people to you. Attitude is such an important attribute in life and leadership. It’s so easy to have a negative attitude about everything. When we do that, we will become one of many faces—normal, average. My coach once told me, “Faces change, but attitude stays the same.” When you challenge the way you think, then you can come up with solutions instead of only seeing why some things cannot be solved. You also see the good that is possible in all areas of life. Leadership is what helped me and so many others become who we are today. As a young boy, my family struggled by the hands of weak leadership. I made sure when I became the leader in the home that I would stay strong in my leadership so that my family could thrive. Leadership is not so much what people say, but rather it’s about what they do. When you create good habits of leadership, then those habits make you a great leader. Advise: Have you noticed a considerable shift in school culture issues today versus when you first began offering your programs, or are the subjects you cover mainstays in most school environments? Hawkins: I have noticed that the students have changed in many ways. In a lot of ways the change has been good, but at the same time there are things we can work on when it comes to our students’ culture. Students still want a sense of belonging and feeling of acceptance. Maybe the way we are going about it has changed somewhat. A student used to get most of their support from home. Now students need that support more at school. Our program is centered on the importance of creating connections with all people. It is this connection that every student will always need so that they can have a productive and fulfilled education. Advise: Why do you think student councils and the Honor Societies are great outlets to assert student leadership? Hawkins: I think that student council, the National Honor Societies, and any other positive activity that a student participates in are critical to his or her success. Every student needs something to do, something to hope for, and something to love. If students don’t have positive things to keep them going, they will find negative things to do. When you go down the road of negative things in your life, it’s hard to have hope—not to mention something to love. I know when students are connected with something positive in their lives, they have something to hope for. When you have hope that helps, especially on the days that are hard when you don’t want to be at school. The connection with the activity gets you to school; hope keeps you there. When you’re fully engaged with everything school has to offer, you feel like you have a life worth loving. Advise: During your middle/high school years, was there a particular teacher or adviser who inspired or influenced you most directly? Hawkins: Educators have inspired me throughout my life, especially in middle and high school. Mr. Joseph was my middle school principal. He became a father figure who gave me boundaries. Those boundaries made me coachable, and being coachable has helped me be successful in every area of my life. In high school, my activity director Don Rizzi taught me responsibility, accountability, family, leadership, and excellence. One day, my mom’s car broke down, so I had no way to get to school in order to go to a leadership conference with my student council. I called Mr. Rizzi to tell him I couldn’t make it. Instead of giving up on me, he said he would pick me up. I told him that I lived 15 miles away from school, and the next thing I knew, he shows up in front of my house with a huge yellow bus full of the student council students. Rizzi opened the door and told me, “Hop on! We leave no one behind.” That’s why family comes to mind when I think of school—one big old family. Advise: How do you grab the attention of student audiences and keep it? Hawkins: I use energy, enthusiasm, and encouragement to grab my audiences. You cannot have those three attributes if you don’t have love for the people you’re speaking to. I look in the audience and I see young people who are like my kids. I see students who are brothers, sisters, aunts, uncles, and grandkids. I ask myself how I would want my kids to be spoken to. What message would I want them to hear? When audiences know that you really care about them, it’s much easier to hold their attention because they become part of what you’re saying as a speaker. Advise: Why is leadership such an important quality to instill in today’s students? Hawkins: Leadership is so important because we all need to be leaders. People think that in order to be a leader they need to lead others. If you’re going to make the right choice and make good decisions, you need to lead yourself first. Leadership comes down to choices and decision making. If we all made better choices and decisions, our world would be better. Advise: If you were going to impart advice and guidance to the secondary level students of today, what would you share? Hawkins: Remember, it’s not what people expect out of you, it’s what you expect out of yourself. You never have to prove anyone wrong; just prove yourself right. Don’t give people what you have or what they give you. Give people what you need. I will give patience, support, acceptance, inclusiveness, kindness, respect, forgiveness, and love, because that is what I need. Many of you are unsung heroes—working tirelessly to help your school’s most promising students grow into remarkable leaders ready to take on the world. Each year, the national office acknowledges this commitment with its Rynearson National Adviser of the Year award. Named for Edward Rynearson, the principal who established the first NHS chapter in 1921, this award seeks to “sing the praises” of one NHS and one NJHS adviser annually. Advise recently sought reflections from three past winners: Rebecca Duda, 2014 winner and former NJHS adviser at Justus C. Richardson Middle School in Dracut, MA; Jennifer Roberts, 2015 winner and NHS adviser at Hallsville High School in Texas; and Kelli Bradley, the 2017 winner and an NHS adviser at Mount Pleasant High School in Wilmington, DE. What time management suggestions would you share with peers? Roberts: Get a great record-keeping system for service hours, probation, even T-shirts. I use a pretty extensive spreadsheet. I would also suggest some really effective communication with your members. We utilize Twitter, Instagram, Facebook, and Remind. This summer, I created an app through appypie.com so we can keep everything together. What advice would you give to any chapter adviser? Duda: Don’t be afraid to ask questions and reach out to the national office or other advisers. There is a lot to learn. What do you say to an adviser who is struggling with the role? Duda: Be patient. It takes times to establish rituals and traditions for the chapter and create a school culture in which it is highly valued to be a member. What do you value about having NHS as part of your school community? Roberts: Like the torch, I think NHS members are a light for others, whether that be in the classroom, on the field, or in the cafeteria. I hold members to a high standard, and they rise to meet the challenges. As a result, we are able to work within and for our school and our community to make them better, whether that is by using our voices, our hands, or our hearts. What is your secret to chapter success? Bradley: I let the kids run it. We [advisers] are guiding. When I get an email from a community member, my president responds. He delegates from there. I tell [prospective officers] you can’t have any other office in the school. I think they do more than any other student officer does [because they need] an opportunity to work through things. … I am only as good as my students make me look. I am truly honored by this award, and it’s a direct reflection of the hard work of my NHS students over the years. The deadline to apply for the Rynearson National Adviser of the Year award is February 15. Visit www.nhs.us/rynearson or www.njhs.us/rynearson for application details. OMO—you know, the fear of missing out. Have you ever experienced it? Well, you might once we walk you through all the opportunities you’re missing if you haven’t logged in to NatStuCo’s greatly enhanced online Adviser Resource Center (ARC). To get you more deeply acquainted with the time-saving and knowledge-building options we’ve designed to centralize and simplify your tasks as an adviser, here’s a peek at what you will find “behind the curtain” when you visit www.NatStuCo.org/arc. New Advisers. Need guidance in building a constitution for your council? You’ll find help here. Plus, you can check out our Adviser’s Checklist of Essential Skills and a step-by-step action guide for starting a new council. Even seasoned advisers may wish to visit these pages for hints on ways to freshen up their practices. Council Operations. Meetings … officers … budgets—all of these operational details can make or break your council. Browse this section to discover gems such as an outline for running a meeting using parliamentary procedure, sample meeting minutes, budget basics and best practices, and job descriptions for your officers. And, should you ever be faced with a situation requiring disciplinary action of a member, this section offers guidance to ensure you are applying measures in a fair and consistent manner. Elections and Selections. A student council election is one of the most visible demonstrations of governance and student voice in action! This section offers valuable content on preparing candidates for campaigning, voting and balloting considerations, and guidance on officer installation ceremonies. Publicize Your Council Activities. Share good news! This section provides tips to help you promote your council’s accomplishments through local media. You’ll also learn best practices for leveraging social media to engage students and target the press, plus find sample press releases here. Conferences and Events. To make your online experience a one-stop shop, we’ve included all the details you’ll need on the ever-popular Leadership Experience and Development (LEAD) Conferences and the National Student Council Conference—you don’t even have to leave the ARC! Glean all the necessary details here. Plan Projects and Activities. Projects often become the heart and soul of a council. Kick-start the process via direct log-in access to the more streamlined National Student Project Database. Today, the database boasts in excess of 6,000 entries, so you’ll be able to more easily filter and sort projects to identify the perfect idea for your council to implement. There’s also advice on fundraising best practices. Online Learning. Here, discover your gateway to the Career Exploration Series, videos showcasing young professionals ready to share their stories and preparing your leaders for post-graduate life. Publications. Because we want your Resource Center to be a comprehensive tool, this section gives you access to current and archived editions of Advise magazine and NatStuCo E-Bulletin. These publications are your way to stay up to date on NatStuCo activities and events. NatStuCo Handbook. Get the soon-to-be-published, all-new NatStuCo Handbook here and use it to help your council operate at peak efficiency. It’s a great tool for those who want a more detailed plunge into the many facets of student council operations. What are you waiting for? 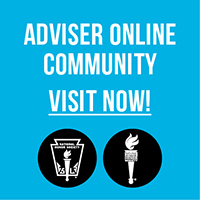 Make your life as an adviser easier by logging in at www.NatStuCo.org/arc. We always welcome your feedback, too. Let us know how we can help by emailing NatStuCo@NatStuCo.org. Get ready to Make Your Mark on the World: Dream. Lead. Serve. That’s the theme for this year’s National Student Leadership Week (NSLW), an annual opportunity to honor student leaders. NSLW 2018 will be celebrated April 15–21 and features a contest for you and your student leaders to really bring this theme to life. Start thinking about how your chapter or council could use a cash prize to fund implementation of a “dream” project, then create and share your pitch on social media using #OurDream18 in your post. See the poster in the centerfold of this magazine, along with contest details … and start dreaming. For more information and tips on other ways to celebrate the week, follow #NSLW2018. NJHS advisers: Would you like to give your most impressive members a head start on their college savings? Of course you would! Nominate your top NJHS members for an NJHS Outstanding Achievement Award. There will be 500 honorees each receiving a $500 college savings award managed by OppenheimerFunds (OFI Private Investments) as part of the New Mexico Education Trust Board’s 529 college savings plan—The Education Plan. Nominations are open through March 13, and you may nominate as many NJHS members as you wish. (Prior winners are not eligible and should not be nominated. However, prior nominees who did not win may be nominated.) Find nomination information at www.njhs.us/oaa. Are you going wild with your planning and fundraising to attend the National Student Council Conference, June 25–27? With the theme Leadership MaNia, host Wayzata High School in Minnesota is going crazy to make this an insanely inspirational experience for you and your students. It’s a great opportunity to let your rising student leaders get ideas to boost the culture and climate of your school for the 2018–19 academic year. The deadline to catch early-bird pricing is approaching. Register by April 20 to save! Visit www.NatStuCoConference.org to learn more or to register. Follow #StuCoMania on NatStuCo’s social channels to join the excitement as it builds. National Student Council wants to give student leaders a leg up in their career journey. That’s why the national office has released a career exploration video series featuring former student leaders providing a snapshot of their occupational choice and the path they took to get there. Many young professionals representing a variety of fields are profiled, describing day-in-the-life accounts of their career. New episodes will continually be added. Share the series with your students by visiting www.NatStuCo.org/career-series. Many school leaders want to empower their students to exercise their voice toward the good of the school and community. National Student Council’s Raising Student Voice & Participation (RSVP) program does that by using a structured format that allows student councils to identify and lead initiatives to improve the school or community. Schools that have used the program note higher levels of student engagement and a more personalized school experience for the student body. The program is being refreshed and will be available soon for implementation in your school. Learn more at www.NatStuCo.org/rsvp. February 7: NHS/NJHS college admission planning webinar “Payingfor College: Defined.” See www.nhs.us/webinar or www.njhs.us/webinar for registration. March 21: NHS/NJHS college admission planning webinar “You’re Accepted—Now What?” See www.nhs.us/webinar or www.njhs.us/webinar for registration.